This is for Yoshi Car - Mario Cart Carrera - Micro scalextric. This is working. Size is approx 7cm x 5cm as per photos. Please see photo of actual item. Some minor chips. Please check photos as these form part of the description. This is for Toad Car - Mario Cart Carrera - Micro scalextric. This is working. 20p coin is not included and is for scale only. Please see photo of actual item. Some minor chips. Please check photos as these form part of the description. Jaguar Xj220 TVR RACING / UNIPART. WITH JUST HORNBY ON THE BASSES, I THINK THESE ARE FROM THE ERA WHEN HORNBY HAD JUST TAKEN OVER SCALEXTRIC?. 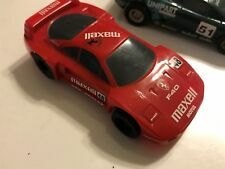 FERRARI F40 MOTUL / MAXELL. TO TEST IT IVE USED THE ONE PICK-UP & SENT POWER DIRECT TO THE ENGINE. This is for Mario Car - Mario Cart Carrera - Micro scalextric. This is working. Size is as per photo approx 7cm x 5cm. Please see photo of actual item. Some minor chips. Please check photos as these form part of the description. The Centenario is able to accelerate to 100km/h in 2.8 seconds and go on to a top speed of more than 350km/h. STRETCHER CREW. AND FINALLY-. ABOUT THE SLOTOUTLET. 27403 Nevus 1/32 Slot. (Triang, Exin, Tico, order, Scx, Planet Toys, Openslo, Tecnitoys, Fly, Borras, Scalextric). MOTOR MABUCHI, 22,000 R.P. REAR-WHEEL DRIVE. FEATURES: SCALE 1:32. Team Black FAlcon VLN 2011 No. 35. This is for Mario Car - Mario Cart Carrera - Micro scalextric. This is working. 20p coin is not included and is for scale only. Please see photo of actual item. Some minor chips. Please check photos as these form part of the description. MICRO SCALEXTRIC SLOT CAR. RALLY DIRT RACERS CARS. 1:64 RALLY RACERS SERIES. 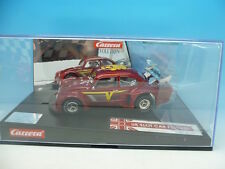 Greenhills Scalextric Carrera Go! Ferrari F1 No 5 1:43 Scale - Used - 19606. Ferrari F1 No 5 1:43 scale. SKU: 19606. T his Model is used and in very good condition with only minor marks but is missing its rear wing. This is for a small selection of extra track which consists of 6 x curves. For Carrera Mario Track Micro. Please check photos of actual item you will get. Also check ALL photos as these form part of the descriptions. It’s possible there is damage on sections but I have not noticed but please bear this in mind. Check photos to help. Useful to expand or replace broken missing sections. This is for battery pack to power the small section, figure of 8, For Carrera Mario Track Micro. Working order. Needs battery size ‘D’ x 4. The batteries are not included. Please check photos of actual item you will get. Also check ALL photos as these form part of the descriptions. Check photos to help. Useful to expand or replace broken missing sections. This is for a small selection of extra track. For Carrera Mario Track Micro. Please check photos of actual item you will get. Also check ALL photos as these form part of the descriptions. The only damage I can see is one of the small plastic clip has an edge broken off but it still seems to fit together ok. It’s possible there is damage on other sections but I have not noticed but please bear this in mind. Check photos to help. Useful to expand or replace broken missing sections.